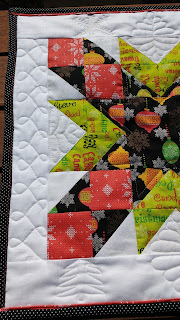 I think that's all the Christmas sewing happening round here, having completed this runner I had fun with it. I did a simple in the ditch around the stars but got more creative in the white spaces. In the border I did a few random things - Christmas trees, a gift, tried a snowflake - its at the top in this shot, not a great idea, but still fun to have a go. I also tried the piped binding which is remarkably easy, just make the binding up of the two colours, the 'feature' in my case red, cut to 1 3/4" and the main (black with white dots) 1 1/2", join together down the long sides of the pieces to make up the binding strip, then press in half as you would usually do. This creates the piping with it just peeping out. 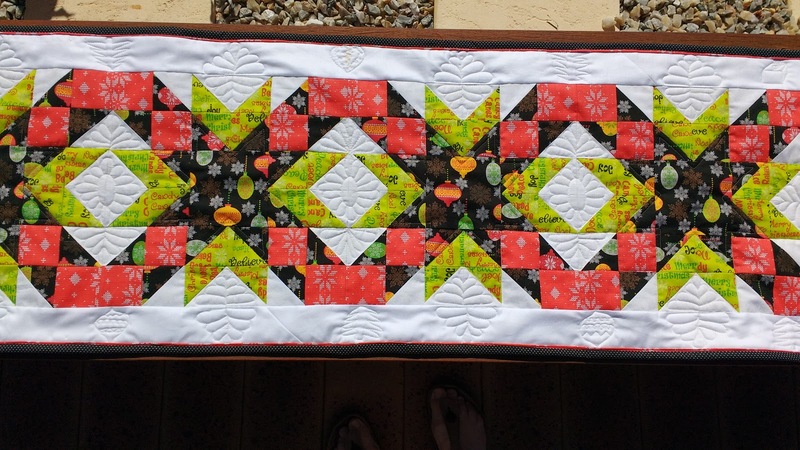 Attach to the back of the runner/quilt, with the 'feature' fabric being the most visible, of facing towards you, then turn/flip over to the front and machine the binding in the ditch of the feature to show your piping. Should have taken photos of the process, but got the tips from an Aunt Marti tutorial page. [http://www.52quilts.com/search/label/Tutorials] She called it Susie's magic binding so I guess she got the idea from somewhere else too - isn't that what the internet patchwork and quilting community is all about, sharing what we know? 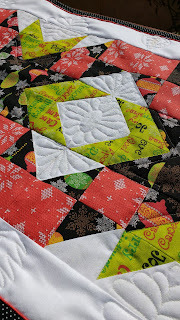 Anyhow, here's another of my runner a little closer up and finally one showing the backing. And now to get back to my list for completion (maybe i'm dreaming?) this year. I have 2 to sandwich and quilt and two that are already for quilting - one more than half done the other to begin. So maybe I'll finish one, but you know what they say, if you don't have big goals, you don't achieve anything! 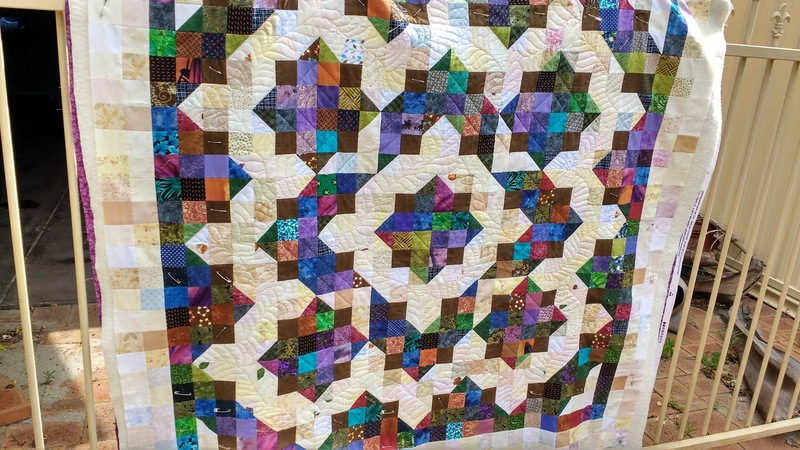 This is the one that is partly quilted, done some of that feather work in the cream areas and some straight lines in the darker ones. Really just the edges to go. I'm happy with how its going so far, so I'd better get busy! 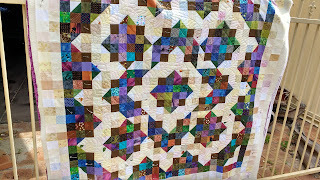 Linking up with Needle and Thread Thursday and Confessions of a Fabric Addict. Labels: Half square triangles; free-motion quilting; table runner. Oh my word!! Your table runner is exquisite. I don't know if it's the brilliant colors along with that design or what. The black makes everything else pop. Thanks for sharing. Thanks, it was fun to do and made from a little bundle my husband brought back from a trip, so how lucky was that? Lynn!! OMG! I have that exact pattern sitting out on my little chest of plastic drawers, to remind me I want to make it this winter! Love your rendition. :-) The runner is great, love your quilted trees and yep, that piped binding is "da bomb"! Hey Sandra, I might try this binding more often, had just enough fabric to do the sides then it ran out! So I had to place very carefully to get it to work out. 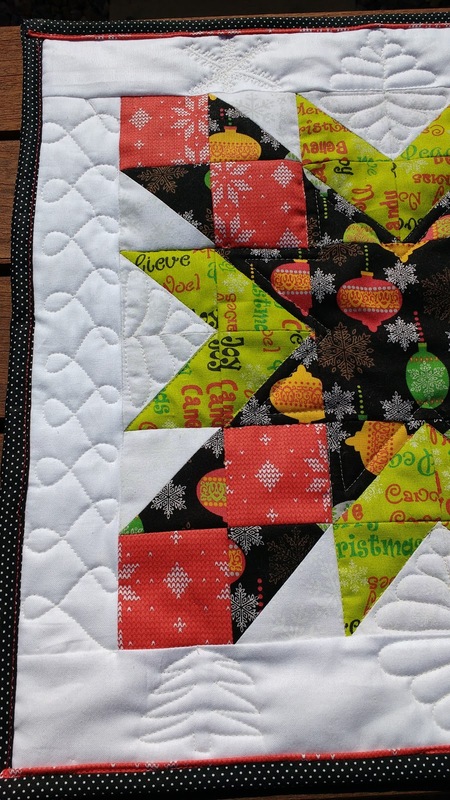 I love the FMQ on your Christmas runner. The bright slightly offbeat colors are awesome, too. I second you on Susie's magic binding. 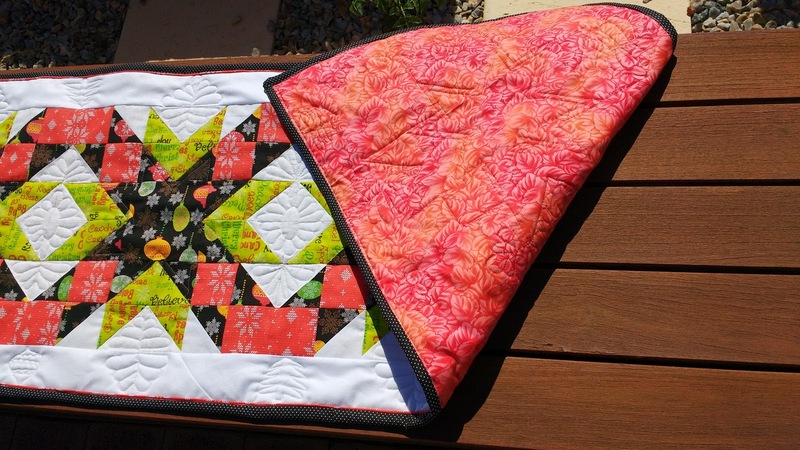 I have used it on three different quilts now and like the spark of color it brings and the time it saves in hand sewing the binding.